Once upon a time, Palm Springs turned into a scorching-hot ghost town come summer; snowbirds fled, restaurants closed up shop for the season, and there was absolutely nothing going on. Times have totally changed, though -- well, other than the scorching-hot part -- and thanks to summer festivals like two-weekend EDM extravaganza Splash House, a Comic-Con offshoot, and all those bachelorette parties, it’s the perfect destination for a weekend of poolside partying or just vacation-y chillaxing. As a bonus, hotel rates are at their lowest this time of year, so you can go ahead and stay an extra night... because June gloom is nothing to rush back home for. Here are 15 hot hotels to match the temps for your summer stay. The seven-story hotel -- the anchor property of the city’s long-planned Downtown redevelopment project -- is now the tallest building in all of Palm Springs, which means guests get up-close mountain views from rooms, the top-floor upscale restaurant 4 Saints, and the rooftop pool deck and bar. The clubby lobby is also a fine place to hang with backlit bookshelves galore, funky leather sofas, mid-century touches, and a sophisticated cocktail bar overlooking the plaza. Rooms are bright and contemporary with floor-to-ceiling windows and Atelier Bloem bath amenities. And, in a refreshing departure from the trend of ever-increasing hotel fees, pets of all types are welcome free of charge. This brand-new boutique hotel set along Palm Desert’s high-end shopping stretch El Paseo meshes modern with California cool, thanks to its airy, marble-lined lobby, whimsical art installations, and backyard lawn with fire and water features, a putting green, and a 1950 Airstream you can actually stay in. If you’re looking for a proper room, however, there are 150 of them complete with spa-style bathrooms, and many feature balconies as well. The Billiards Suite, meanwhile, comes equipped with a pool table, wet bar, Shinola record player, and vinyl collection. The owners of popular Palm Springs restaurants Copley’s and Trio have teamed up for restaurant AC3, with chef Andrew Copley at the helm in the kitchen churning out inspired comfort food. 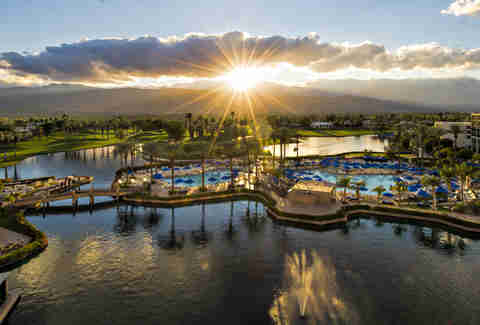 If golf is your thing, the hotel is partnering with nearby Desert Willow Golf Resort for a room package that includes a round of 18 holes and more. After lots of anticipation around its 2016 opening, Arrive is still living up to the hype. It has a modern, comfortable feel, featuring nods to Palm Springs' famous mid-century style via clerestory windows and butterfly rooflines. 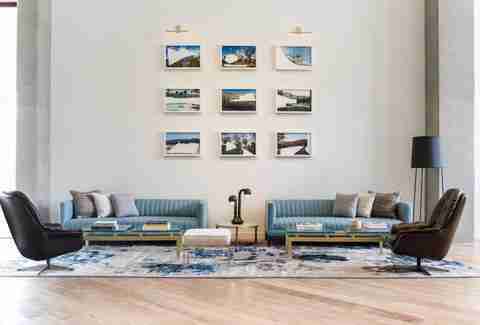 The place also offers a chill-yet-fun vibe, eschewing a traditional lobby in favor of handing over your room key -- along with a drink -- via check-in at the bar. The grounds easily encourage socializing (and welcome locals) with group seating around fire pits, comfy cabanas, outdoor games, and monthly dive-in movie screenings. The food and drink options here are plentiful: grab salads and shareable plates at airy poolside eatery Reservoir -- which will be transformed into LA's Wexler's Deli this fall; a cup of Intelligentsia at Customs Coffee; and cones of artisanal flavors like local date and pink ginger at Ice Cream & Shop(pe). The hotel’s next-door gastropub Draughtsman doles out gastropub fare and -- still a Palm Springs rarity -- a late-night menu offered Wednesday through Sunday from 10pm till 1am. In a town that's all about groovy midcentury style, the rustic-chic vibe of the restored Sparrows Hotel feels like another world (albeit a world with an equally cool design aesthetic). There are only 20 rooms, each with wood-paneled walls, poured concrete floors, natural stone accents, and open-air bathrooms, most featuring horse troughs repurposed as tubs. (No actual horses, though. Sorry.) The hotel's intentionally mellow vibe pretty much ensures you'll just want to kick back and enjoy the seating areas scattered among the fruit trees, herb-filled planters, bubbling fountains, intimate pool, and big stone fireplace that's the site of nightly s'mores sessions. The casual Barn Kitchen does a curated lunch menu of snacks, salads, and sandwiches (you must must, must get the chicken salad), and hosts reservations-only, twice-weekly suppers (steak on Saturdays, chicken on Wednesdays) for guests and those in the know. Big plus: No kids allowed. The newest addition to the valley, this ‘50s hotel between Palm Desert and La Quinta recently got a glam reboot, unveiling its pink-and-patterned look mere weeks ago with a nod to both old Hollywood design and Moroccan elements. With just 46 rooms, the common areas and courtyard pool still manage to feel intimate even when the place is fully booked up. The Pink Cabana restaurant is modeled after tennis clubs from the ‘50s and ‘60s, and features seasonal Mediterranean-inspired fare along with an inventive drink list, while the three-treatment-room spa is centered around natural-sourced products from Morocco. This place will likely become the spot to stay for those streaming in for the nearby BNP Paribas Open in Spring or, of course, Coachella -- a mere 15 minutes away. The historic hotel reopened last year after a major overhaul and now touts 18 chic rooms housed in single story Spanish-style buildings complete with hardwood floors, eclectic furnishings, colorful tile work, and private patios with fire pits and claw-foot tubs for soaking under the stars. Joane Garcia-Colson (formerly of Uptown’s Dish) recently came on as executive chef of the hotel’s pretty, pool-adjacent eatery Azucar. For post-dinner cocktails, head to open-air lounge Sugar High upstairs, complete with fireplace and mountain views. Boozy touches abound for guests with check-in Champange and a “Tequila welcome” in your room. 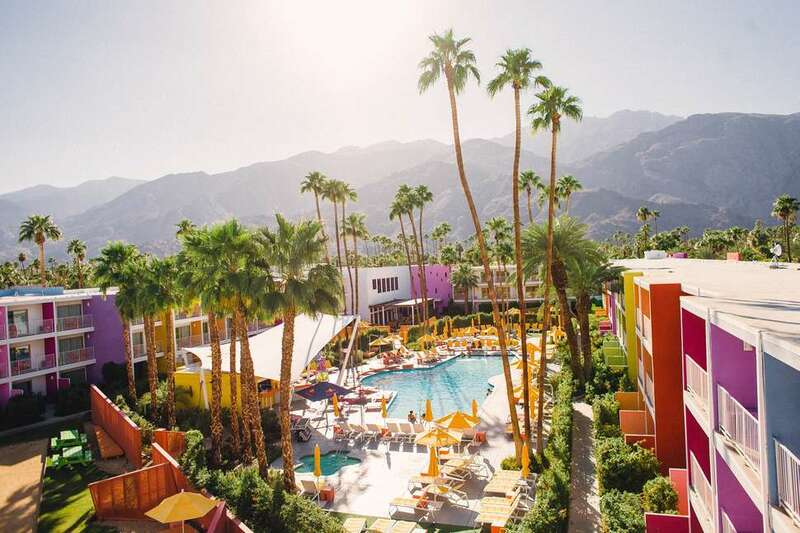 This energetic South Palm Springs hotel remains one of the area’s most-Instagrammed locales thanks to its rainbow-hued buildings flanked by the stunning San Jacinto Mountains. Rooms all come with either balconies or patios, along with workstations (but c’mon, you’re not here to do any actual work) and organic linens. There’s constant fun happening by the pool with weekend DJs, parties, and daybed rentals on weekends, and the onsite taqueria and tequila bar El Jefe is always worth a stop, especially on Taco Tuesdays (and Thursdays, too) when you can get the namesake dish a la carte for $4 and solid margaritas for $5. It’s probably best known as the home of fabled piano bar Melvyn’s, but after a recent overhaul by new management -- San Francisco-based Plumpjack Group -- this hideaway hotel within walking distance of Downtown is worth a stay, too. Originally built in the 1920s, the look of the low-slung property skews toward updated Spanish Colonial Revival, and rooms have been given posh touches like leather and velvet-upholstered furniture, tiled fireplaces, and French doors leading out to private outdoor seating areas. The hotel recently rolled out an early evening room-side martini service, where guests choose their liquor (gin? Vodka? ), style (dirty? with a twist? ), and a mixologist will magically appear at your door and shake up your drink. The same owners of Sparrows worked with LA interior designer Mark D. Sikes to complete their renovation of the 1950s 28-room property last year. The result is the stylish Holiday House, splashed with blue and white decor and home to a notable art collection with highlights by Roy Lichtenstein and David Hockey. The idea is to create a communal environment with loungey covered seating lined up along shuffleboard courts, and a perfect pool that guests don’t want to leave. Rooms have big showers, bold wallpapers, custom textiles, and fun minibars and are purposely without TVs. In the style of Sparrows’ weekly dinners, the hotel’s in-house eatery The Pantry offers family-style Fried Chicken Fridays in addition to a daily lunch menu and weekend brunch service that’s open to the public. Still one of the hottest hotels in town (and the one voted most likely to provide a celebrity spotting), this Jonathan Adler-designed, Hollywood Regency-style sprawling property -- which once belonged to old-time cowboy flick star Gene Autry -- is luxurious and quirky at the same time. Though the property is absolutely huge by Palm Springs standards, it doesn't feel that way, thanks to a labyrinth of pathways winding throughout the lush grounds that lead to hidden pools, a croquet lawn, Pétanque courts (it's like bocce, but fancier), and multiple regal-looking buildings. Inside you’ll find perfectly luxe estate rooms with four-poster beds and cool art, as well as higher-end, free-standing one-bedroom villas with wet bars, giant patios, and separate service entrances. The cheeky outdoor eatery Norma's is best-known for its brunch, while signature restaurant Mister Parker's is dark, fancy, and French. Newer addition Counter Reformation wine bar is one of town’s top spots for a pour and small plate. Back when the Ace first opened in 2009, the whole world may not yet have known about hipsters -- but the hipsters definitely knew about the Ace. 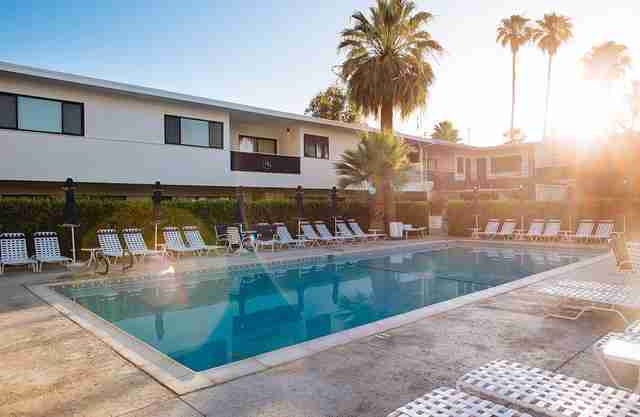 This renovated motor lodge started promoting DJ-spinning pool parties on weekends, hosting weekly tongue-in-cheek bingo sessions, serving up craft cocktails, and bringing in actual bands that wouldn't start playing until like 10pm (just like LA!). Nearly a decade in, the Ace is still a go-to spot for those looking for good music, drinks, and a chill pool scene. 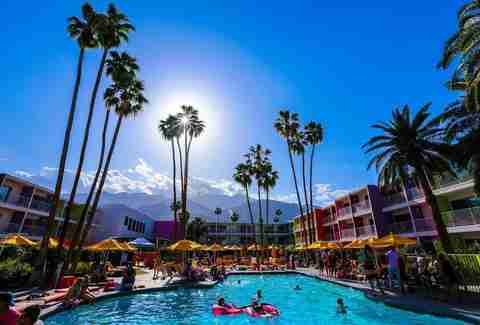 With its modern roadside diner-style restaurant King’s Highway, retro bar Amigo Room, and a design that combines campy Americana and midcentury cool -- with a dose of "desert nautical" thrown in for good measure -- the Ace Hotel & Swim Club could only belong in Palm Springs. Its always packed events calendar also includes weekly trivia and karaoke, Sunday beer nights, and a not-to-be-missed monthly full moon drum circle party. Seriously. A two-year renovation by designer Steve Herman turned this William Cody-designed architectural gem, originally built in 1952, into some of the most glamorous accommodations in town. It feels more like a private compound than a hotel, with low-slung bungalows that boast floor-to-ceiling glass, post-and-beam ceilings, indoor and outdoor showers, luxe linens, and private patios with mountain views you could stare at all day. 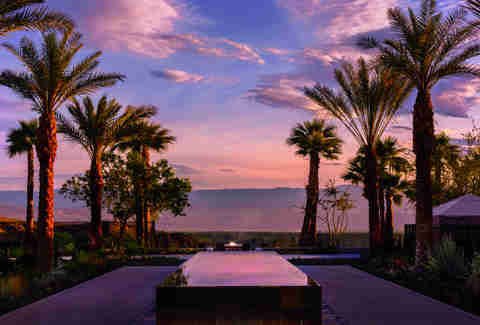 The serene setting also features an infinity-style pool, fire pits, and water features around the property, as well as a guests-only cocktail bar, and the sophisticated al fresco restaurant SO•PA. As per usual, the Ritz-Carlton is keeping it classy with its luxury-hotel hands on one of the best possible locations around, up a winding drive on a bluff just off the main drag, Highway 111. With walls of glass everywhere, there's no possible way of missing the spectacular views of the expansive valley, neighboring towns, and mountain ranges. The super-swanky onsite steakhouse The Edge (where prices are as breathtaking as the views) is perched, yep, right on the cliff's edge, as is the adults-only pool, and one of the coolest fire pit areas we've ever seen. The stylish, desert-hued rooms have the expected glass-enclosed showers, soaking tubs, and Frette linens, along with balconies or patios with plush furniture. In terms of location, you can't do much better than this boutique hotel that's within walking distance of all the fun to be had both Uptown and Downtown. Originally built in 1936, the Spanish colonial-style property isn't enormous, but has everything you need, including a beautiful pool, mellow poolside bar, and restaurant serving breakfast, lunch, and dinner with a focus on local, California-style fare. (Bonus cool points: the restaurant is named The Purple Palm as a hat tip to the hotel's original owner, a member of the bootlegging mob The Purple Gang.) Rooms have patterned wall prints and original tile work, and some even have claw-foot tubs, fireplaces, and patios. This mega resort pretty much has it all: man-made lakes, a gazillion restaurants (some of which you can get to by boat), two golf courses, a nightclub complete with bottle service and a steady stream of bachelorette parties, a serious spa and gym, and a bunch of really cute pink flamingos. All of the rooms have outdoor balconies, and run the gamut from basic kings to a giant 2,000-square-foot chairman's suite with living and dining rooms. Be sure to check out the buzzy Lobby Bar with a killer scenic backdrop, lounge-y cover bands on weekends, and a sushi bar -- and this summer, look for the resort’s Good Vibrations package complete with a moon-bathing picnic set (including both a crystal chakra set and a cocktail kit), digital meditation guides, and two day passes to the spa. Lizbeth Scordo is a food, travel, and lifestyle writer who is probably talking about Palm Springs right now. You can often find her sweating in 110-degree heat on Twitter and Instagram.